Pirates of the Caribbean: The Curse of the Black Pearl (film) In the 18th century, Captain Jack Sparrow is roguish yet charming, as he sails the Caribbean. 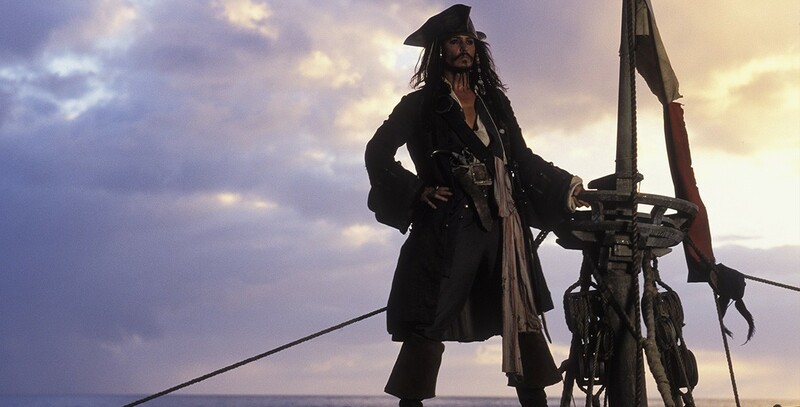 But Jack’s idyllic life capsizes after his nemesis, the wily Captain Barbossa, steals his ship, the Black Pearl, and later attacks the town of Port Royal, kidnapping the Governor’s beautiful daughter, Elizabeth Swann. Elizabeth’s childhood friend, Will Turner, joins forces with Jack to commandeer the fastest ship in the British fleet, the HMS Interceptor, in a gallant attempt to rescue her and recapture the Black Pearl. The duo and their motley crew are pursued by Elizabeth’s betrothed, the debonair, ambitious Commodore Norrington, aboard the HMS Dauntless. Unbeknownst to Will, whose father once served with the crew, there is a curse that has doomed Barbossa and his men to live forever as the undead, where each moonlight, they are transformed into living skeletons. The curse they carry can only be broken if a once-plundered treasure is restored and blood is spilt. Released on July 9, 2003. A Walt Disney Pictures film in association with Jerry Bruckheimer Films. Directed by Gore Verbinski. Stars Johnny Depp (Captain Jack Sparrow), Geoffrey Rush (Captain Barbossa), Orlando Bloom (Will Turner), Jonathan Pryce (Governor Swann), Keira Knightley (Elizabeth Swann), Jack Davenport (Commodore Norrington). 143 min. Filmed in Super 35-Scope. The set for Port Royal’s Fort Charles was built on a bluff at Palos Verdes, California; Caribbean filming took place at St. Vincent and the Grenadines. Since the film is an homage to the popular Disneyland attraction, the film’s premiere was held at Disneyland on June 28, 2003. The film eventually grossed over $300 million, placing it right behind Finding Nemo as the #3 film of the year. It received five Academy Award nominations (Best Actor [Johnny Depp], Sound Mixing, Sound Editing, Visual Effects, and Makeup). Released on video in 2003.